- Conveniently type Akan (Fanti, Twi, Akuapem), English, Ga-Dangme, Gbe (Ewe, Ewegbe, Fon), Gikuyu, Hausa, Igbo, Wolof and Yoruba. - The project for this app is maintained at https://github.com/mereba/kasahorow-Keyboard-For-Android. 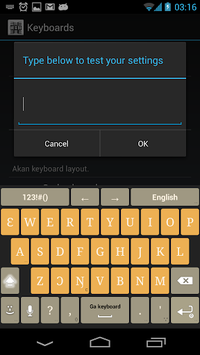 - Some characters including capital letters of some of the layouts are not supported by Android 4.2. 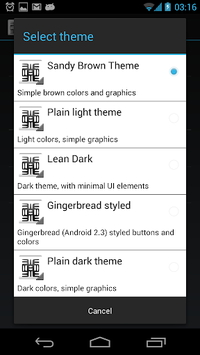 Known issues in respect of font support are slated to be fixed with the release of Android 4.3. Check here -- https://code.google.com/p/android/issues/detail?id=26037 -- for more details. - Update -- As of Android 5.0, the new system fonts support all characters in the app. - This app is based on the AnySoftKeyboard project maintained at https://github.com/AnySoftKeyboard/AnySoftKeyboard. 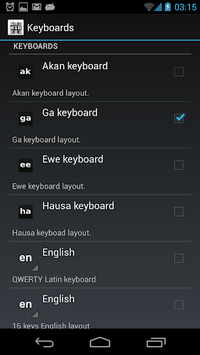 Twi keyboard, Fanti keyboard, Akwapim/Akuapem keyboard, Akan keyboard, Ga keyboard, Ga-Dangme keyboard, Gbe keyboard, Ewe keyboard, Gikuyu keyboard, Kikuyu keyboard, Hausa keyboard, Igbo keyboard, Wolof keyboard, Yoruba keyboard, Ghanaian keyboard, Nigerian keyboard, Kenyan keyboard.